After I saw Sharat Katariya’s debut film Dum Laga ke Haisha I hoped Katariya won’t sell out to the star system. But his second film starred a market-friendly lead star. Then I hoped Katariya’s second film won’t lose the charm and innocence of the first. 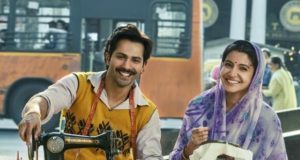 Providentially Sui Dhaaga loses none of the delicacy and sting even while providing space to it’s leads to surrender of to their characters. Dhawan’s performance is filled with a smothered disappointment it takes his quietly confident deceptively docile wife Mamta to bring out the suppressed ambition in her husband. The aspirational narrative of how Mauji finds his groove with considerable help from his street-wise wife, works like a charm because all the performers are solidly sincere. But most of all Sui Dhaaga wins our hearts because the director never milks the milieu for soppy sentimentality. Nor does he swing the other way to make the middle-class ambience a place to celebrate misery. The tone is constantly energetic yet poised. Katariya is neither awed by stillness nor intimidated by noise.